1/24 scale. Length: 183mm, width: 73mm. 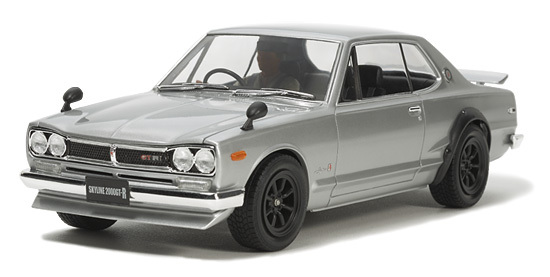 ★The model recreates the Skyline 2000GT-R hard-top fitted with a host of tune-up parts typical of the era. 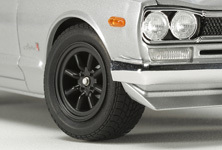 ★Recreated tune-up parts include RS Watanabe 8-spoke wheels and front spoiler. ★DOHC 6-cylinder S20 engine is depicted with strut tower brace and metal air funnels. 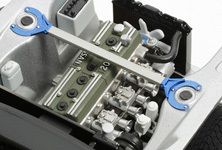 ★Oil cooler is created using separate parts. ★Driver figure included with separate glove and helmet parts. 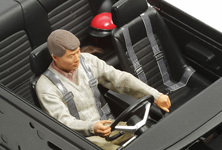 ★Driver figure comes with a choice of 2 left arm pieces depicting him gripping the steering wheel or gear shift. ★Strut tower bar uses photo-etched brace parts. Engine compartment features metal air funnels. ★RS Watanabe 8-spokes were a popular customization of the day. Front spoiler is recreated with separate parts. 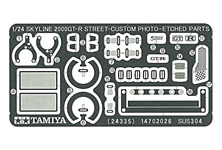 ★Photo-etched parts recreate seatbelt parts, brake discs, license plate, pedals and more with precision. 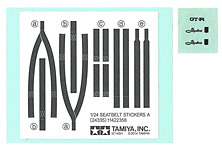 ★Use the included seatbelt stickers for a racy finish! Body-side emblems are depicted by metal transfers.